ISLAMABAD, Pakistan (CNN) -- Pakistani security forces battling Taliban militants in the volatile Swat Valley killed between 45 and 55 of the fighters over the last 24 hours, the military said Saturday. 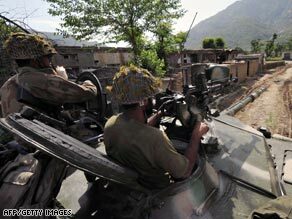 Pakistan has launched a massive military operation against the Taliban in the Swat Valley. An unknown number of civilian casualties also occurred as Pakistan's military continues its offensive against Taliban militants in the country's North West Frontier Province. The fighting is taking its toll across the province, where the U.N. refugee agency reports "massive displacement" of civilians fleeing the warfare. In its daily war round-up, the military said Saturday that the latest fighting occurred in Swat district, where attack helicopters targeting militant hideouts in the district's biggest city of Mingora killed 15 fighters. This occurred amid harassment of the civilian population and instances of looting and arson in the municipality, the military said. Mortar fire in Mingora also resulted in an unknown number of civilian casualties. This development comes as militants used houses as bunkers to fight government security forces. Troops engaged militants in a number of other locations in Swat, including Rama Kandhao ridge in Matta, and destroyed an insurgent headquarters in Loenamal. The military said 30 to 40 militants were killed. UNHCR said the provincial government estimates between 150,000 to 200,000 people in the province have arrived in safer areas over the last few days and that another 300,000 have fled or were about to flee danger zones. The citizens who fled Swat, Buner and Lower Dir districts, are in addition to another 555,000 previously displaced Pakistanis who have fled their homes in the area since August.